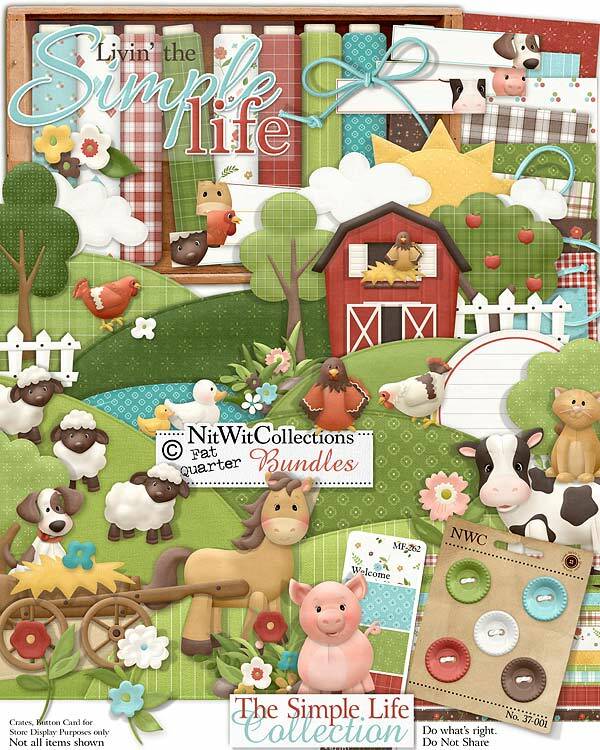 FQB "Simple Life" Collection really brings you back full circle to where life begins....down on the farm! These adorable barn yard creatures will give you hours of creative fun and ideas with their sweet faces and all of the scened elements to add to them. Do you see a great birthday card or layout of your pet?? How about scrapbooking a visit to a petting zoo or maybe even a card for one of your relatives who is a little "Chicken" of something!ha,ha Open up your ideas like the space in the meadows and you are sure to find dozens of ways to use this fun Collection. 1 Barn complete with a hayloft....without the allergies! 1 Cow...now who can resist that face?! 1 Dog - your best friend when creating cards and layouts....everyone loves a dog! 1 Fence - I'll warn you...the cow likes to knock it over, so watch out for him! 1 Horse...a Horse is a Horse, is a Horse of course! 6 Journal tags - each with a different animal's face decorating one end. Who will you pick to use for your layout or card? 1 Pig - clean as a whistle and a curly tail too! 1 Pond to help keep your layouts and cards "clean"
1 Word art - "Livin' the Simple Life"